The Play Store has a special offer these days for Worms 2: Armageddon, you can get the game for less than a dollar. The classic game of Team17 is as exciting as ever, and this release promises the right amount of fun and excitement. The saga has been going on for 18 years, since its debut in 1995. The idea of the game is simple: two armies of worms armed to the teeth with all sort of projectiles that are launched to each other until only one side survives. Over the years, new weapons have been added, the number of simultaneous players fighting has increased and an online version has been developed, but the core of the game remains the same. Even the graphics are very similar to the original! 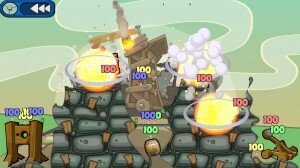 However, Worms is still king of the turn-based artillery games. 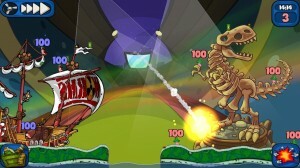 During the combat, worms can move and jump. We have a large arsenal at our disposal, some of them with limited use. So, strategy becomes the key point to win the match. Explosions cause havoc among both enemies and allies alike, and if a worm falls into the water, it immediately dies. The amount of weapons available in Worms 2: Armageddon is the largest of the series. We can choose from over 40 different objects, some of which require fine precision to use them correctly. As an added difficulty, the game has no tutorial, and we have to try to discover the possibilities of each weapon. Luckily, the game features a single player campaign, which is ideal for practicing before jumping into the great battles in multiplayer mode. If you want to take the opportunity to enjoy a great game at a bargain price, Worms 2: Armageddon is available for less than a dollar on the Play Store.